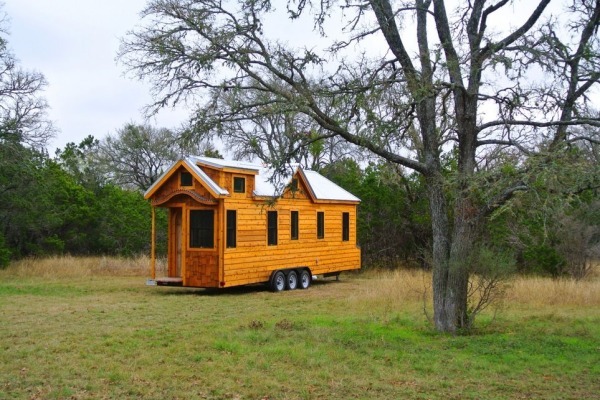 This 30′ tiny house on wheels sits on a a triple axle trailer custom fabricated for the house. It’s has 197 sq. ft. in the main level and an additional 100 sq. ft. of loft space upstairs. Greg Parham, of Rocky Mountain Tiny Houses, is the builder. He recently delivered the home to Driftwood, TX for a family of three. Inside you’ll find two lofts, a bedroom, murphy bed, bath tub, stairs, loads of storage, full size appliances, and more. In my opinion, this is an incredible tiny home. I’d absolutely love living in it. How about you? Our big thanks to Greg Parham of Rocky Mountain Tiny Houses for sharing! Thanks! If you enjoyed this custom 30′ tiny house on wheels by Rocky Mountain Tiny Houses you’ll absolutely LOVE our free daily tiny house newsletter with even more! Thank you! I saw this house by Rocky Mountain in New Mexico near Tijeras on I40. So cool!! Wow. This is fantastic. Probably the second tiny house I’ve seen where I have thought to myself that I could move right in without changing a thing. The first one was a Molecule house but the price tag was scary for me. I wonder what something like this would cost, done by Rocky Mountain Tiny Houses? I love this. Beautifully done. Beautiful! Great tour. Good use of space. Well done! Hey stillnunks ….Your exactly the small minded prick were all tryin not to live around …. I have everything you have in a 400sqft tiny home except 3 bedrooms is waste when your there to enjoy 40 acres. …skylight and all….and I left a 2700 square foot home nestl d in amongst a bunch a pricks like yourself …. Now where I live if u even get within a Mile of of my beautiful view I can go get out of my beautiful scene….you stay in that little crappy house yours with a skylight and a couple bathrooms ….cuz it obviously defines you …defines your character that your miserable enough to have the time to post such a dumb comment ….were not concerned about people like we have begun to see the real world … You stay stuck in yours brother!! Haven’t had your coffee yet? I really really liked this house until I saw the price tag. Close to $62,000. I’m sorry but that puts me out. A TH shouldn’t cost that much. I wonder if this home could have been made cheaper if the cabinets, doors, windows weren’t hand made but store bought. I liked the larger appliances in the kitchen but I could live without a rounded front door, claw foot tub etc, etc. Good luck to the new owners though. I have decided not to worry about prices anymore. As in the free market trade of the rest of the world, when prices get too high, lack of demand will bring them back down. We control the pricing of tiny houses by buying within our personal range. I think this is a very hand crafted TH and as a builder myself “ROADRUNNER TINY HOMES” it is well worth the asking price! I think most people do not understand the whole TH thing? I mean the idea that it can be moved is really what it is all about! You might live in Montana one year and then Santa Barbara the next, you never know what life has in store for us? As far as people who do not have the money or do not want the quality of this style they should just buy a box with store bought cabinets and call it a day. I believe in quality myself …especially if you are going to down size and live in it, why not have the best? I think you are missing a vital part of the tiny home movement. It isn’t just about being mobile. It is about not being saddled with Debt which then controls what you are able to do. The idea is that by down sizing and only holding onto what is important – giving up the materialistic world as it is now – you are gaining freedom and a better understanding of what is really important. While I am sure that $62k is a fair price for the materials and labor in this house…. it fails to embrace what the movement is really about – at least for those of us who do not have $62k sitting around waiting to be invested that way. I would guess most people would be taking out a loan for that kind of money .. which puts you right back where you are with your stick built house that will at least likely appreciate as time goes on. Maybe they sold their big house and that was how much they had invested in the big house. We just finished paying off our 30 year mortgage so whatever we get for the house will be more than enough for a tiny house. I still don’t think I would want to go for fancy since the whole idea for us is downsize to as simple as possible because we are getting up in age and just don’t want to be bothered with stuff. Now is the time to spend with our grown kids and our grandkids and grow heirloom apples and spend lots of time sipping coffee on the patio and watching the sun rise and set. But you are right about the affordability aspect of the Tiny House movement, if people are just going to cram the same amount of possessions and debt into a smaller footprint, what is the point? Yes I get TRAILER LIFE for some reason–I did not renew an old subscription but it keeps arriving!! !–and the complaints from both the reviewers AND the poor people who actually BOUGHT these things is scary. The makers of these things dont seem to ever spend so much as a night in a mock up of their design. Things like no lights in critical places or no room for even a shelf next to the bed; beds you have to crawl into and out of or that have a chunk of the corner taken out to FIT in a room; stairs that are way too high for their target market with our achy and or replaced knees and hips and bathrooms that are deployed on the upper level–who at the target market age wants to hustle and climb for the loo? One I saw in person had a “tub” that was so small my husbands FEET could not even FIT in there—-and he only wears an 11. However they come with electric fireplaces–what a waste!! !-=—and matchy matchy window valances blocking half the view and so little and poorly thought out stowage that whole web sites are devoted to this topic alone. I am pretty sure I am in the wrong business. We know exactly “…what life has in store…” because we plan our days and decades. Then we add our Plan B and Plan C. It’s a good feeling knowing we aren’t at the mercy of “life”! Would you grocery shop without a list, filling your cart at the last instant with stuff at the checkout stand? Would you vehicle shop without listing your needs, buying a two-ton truck while a Smart car would do you fine? Tiny houses are not for everyone. Not all tiny houses are for all tiny house people either. This tiny house is for someone. A family of three. It meets their needs, perhapse not yours. Relative to debt, we do not know their financials. Remember this tiny house is a tiny house bigger than most tiny homes. So much so that it had a custom built three axle trailer under it, costs more. Many hand built features, costs more. The home itself is larger than most, materials cost more.not building it yourself, costs more. Family if three, costs more. Want it for less? Go smaller, simplify the finishes, boxed cabinets not custom, prehung door again not custom. Most importantly, build it yourself do not have it built like this family did. The bible says ‘a man is worthy of his hire’ so expect to pay if you ask someone to do this. A qualified experienced tiny house builder will be worth it if you lack the necessary skill set to do it alone. This is s cool home with some very cool finishes and features. Some I will make my own. 😉 its roughly the size we plan to build. Though on a fifth wheel tandem car hauler. Not for everyone, but great for us and our needs. I trust you all will find what’s just right for you as well. This is a very pretty house. I love the wood paneling insie and out, and what an adorable picture of the tiny house sitting between those two trucks! Cute! The only thing I might have done differently, is put the two master closets in the loft on the rail side so I would not have to climb over the bed to get to them. Otherwise, a very nice house, and looks like you have plenty of room to expand in the future. I have purchased a 22ft trailer for my tiny house, planning to salvage as much of the electrical, plumbing, gas lines (keeping the toilet, tub/shower) as I can and incorporate them into my plans. I have a goal of being completed by Sept30 the latest Oct 31 2015. I just picked up a free sink for the bathroom today. Getting as much repurposed stuff as I can. Glad you are able to do this on the cheap. Be careful with the electrical. For a tiny house new is not that expensive. Used electrical is one of the few things that, if it fails, can destroy your home and/or harm you. Do new. Be safe. Good luck with you build! Not so enthusiastic about the staircase going over what appears to be a food prep area, but I otherwise love the floor plan, Murphy bed, well-equipped kitchen & laundry (this is the first I’ve heard of an all-in-one washer/dryer), interesting angles, obviously solid construction with beautiful materials, and the fact that this home is apparently able to be towed by a F250. And the BATHTUB! I’m not very big, and could just climb in there now with a book, on this dreary rainy day. I’ll definitely mark this page for ideas for my own tiny house, still in the fantasy planning stage. Check out Ragsdale homes room roll outs. Your day has come! Do you have building plans for the six wheel trailer shown here. If you do would you return a note. I’m 66 year old widow and really need to down size. Who did you get the dishwasher from? Where do we get them? You are leaving out critical information. We don’t need you to tell us about what we can see for ourselves; we need you to give us all of the construction information (including where to get what appliances) so we can investigate these things for our own needs. Thanks! I like how the builder added extra room but remained true to building a tiny house. I love the wood. Very few changes that I would change and that is just minamal things of taste. Overall I love it! I would love to own a TH. The problem is, with their growing popularity, it is growing increasingly more difficult to purchase on when you are single and on a very fixed income. On top of that, you can’t get a traditional mortgage. I am physically disabled and would not be able to build one on my own. Its really sad that I will be forced into public housing which will be about 650.00 a month which is more expensive than a mortgage would be on a TH. I have tried to think of ways to make it possible, but have not found a realistic way. Oh well. I like some of the ideas in this one, but, I would change some things to suit myself. I liked Doc’s comments about not judging those who have different likes, needs, ideas than you. Jewel J. if you have your TH built by someone certified for manufacturing RVs you can get it financed as an RV. You don’t have to have someone who only builds RVs to build it for you, they just have to be certified to build RVs. Then you could get the financing and the insurance on it like an RV even if it is a park model. Check it out. I have seen many tiny houses and in my opinion this builder surpasses my expectations and wish list. There are a few things in this house that I can do without being that I am a single male, but the craftsmanship of the people who built this house is undeniable. I am sure the price tag goes along with your demands and the quality of what you put in the house. This is artistry and I want them to build mine. A couple of thoughts…..what if there happens to be a fire start in the kitchen. That child could very well be stuck in that back bedroom, not easy to shinny out the back small window for a child. Also, why a full size bed when a twin Murphy bed would more than do. This space is beautiful, although very claustrophobic in my opinion. I agree about pricing not being an issue when considering quality of custom construction. I sure wish them well. Gee, I thought this website was to give people more options for tiny house living, design ideas, and helpful advice in building and living in a TH, not to bash those that have different budgets, designs or lifestyles. I think Swamp Commander needs an attitude adjustment, and a bar of soap in his mouth. I’m in my 6ps with a disabled sister and a very limited mother in her 80s. The TH I am drawing plans for is certainly larger than TH and more small house. I’m looking at 800 sqft. The home has a lot of musts due to family needs but hear me out. There will bill one bedroom at each end of the house. Connected to each bedroom will be a screened covered porch. There will be a door that leads to porch from bedroom which will include a doggie door. Next to one bedroom will be a large bathroom with wheelchair access shower. A must for mother and who knows about the future. Next to the other BR will be a wheelchair accessible powder room. Toilet and sink. I also have two lofts. One will be small (ladder) for access and will be used for storage. The other loft is large for king size mattress an some cabinet storage. Leading to that loft must have a staircase with a chair lift. There will be storage to house a stackable washer/dryer. As you enter the front door (36″ wide) you will see the seating area which is shaped in a half moon with tall windows to watch nature. The kitchen is on the opposite wall. As we are aging we are not looking at an extremely large kitchen. Modern kitchen apartment applances will be used. As for closet storage, given how wide and long the house will be narrow sides 12″ – 14″ deep built in closets. All still making the house handicapped accessable. It looks great on paper and falls into my budget. One more thing…the house is stationary. Attached to concret foundation with radiant heat. I know many will not agree but we want to downsize but need to be cognizant of the future and my present elderly mother. As the alfa boomers age but want to keep mobile and active this is a way to go. What a great senior community this could be!! I’m in my 60s with a disabled sister and a very limited mother in her 80s. The TH I am drawing plans for is certainly larger than TH and more small house. I’m looking at 800 sqft. More tiny house makers need to make such in depth videos like this! Seriously! This is what people want to see!